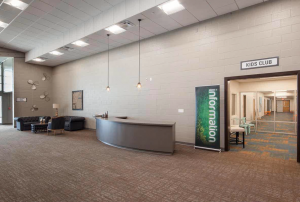 This post is another in our series featuring examples of churches whose vision transformed the design and construction of the church building they worship in. In this case, a church leader started with a building that wasn’t built for worship at all. He saw the potential in an old middle school, then drew us in to collaborate on his energizing vision for ministry in his community. 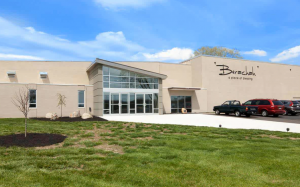 Berachah Baptist Church in Middletown, Ohio, had been struggling with a building that was too small. Their vision was to expand their ministries with a new church design, but they also had very little land to work with. Because they felt confined by their old church building, they decided to take a leap of faith and sell it. When we met Pastor Lamar, they were starting to search for the right location to come along as they worshipped in rented facilities. 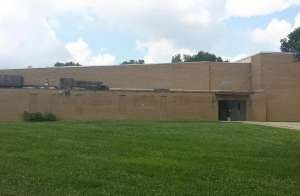 During their search, they looked at two or three different sites, with Pastor Lamar ultimately feeling that this old middle school had great potential. We walked through the building together (as we are willing to do with any church leaders who are evaluating their different church design options) and talked about the potential ministry opportunities of the space. In the end, Berachah Baptist was able to purchase the property, along with 40 acres of land, for a price that worked within the church’s budget. 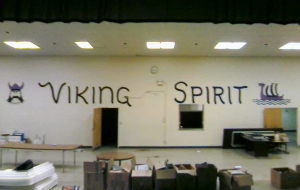 Remodeling a former school campus for a new use can be a very effective process when it’s guided by a strong church vision. 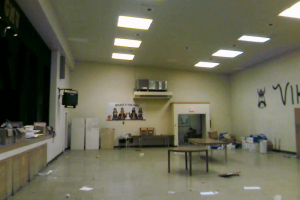 Here are some before and after images of the school cafeteria. 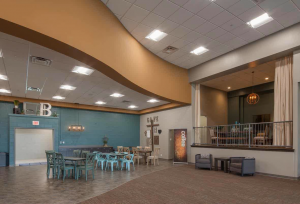 Berachah Baptist wanted a place where people could build relationships, so they turned it into a welcoming foyer and café area. As you can see, the old stage was converted into additional seating, providing more comfortable places for conversation and deepening relationships. In the area which was formerly the cafeteria serving line, we created a secure check-in area for the children’s ministry. This new, bright, well-designed area helps parents feel comfortable and kids feel safe when they check in and go down the hall to their classrooms. 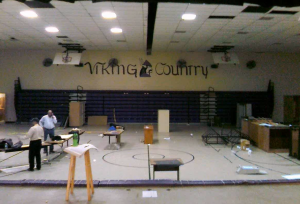 Another portion of the former school transformed by Berachah Baptist’s church vision was the gymnasium. 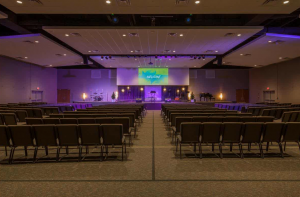 The old, tired space was renovated into a flexible worship center that can seat between 550 and 600 people. This allows the church to continue growing, even offering multiple services to meet the different needs of the community. Additionally, the old school property provides lots of additional space to use as the church grows or when they decide to implement new aspects of their church vision. We never grow tired of working with church leaders to find new ways to support their ministry by helping them create a building that supports their church vision. In our next post, we will share the story of a church that needed support in recovering from a devastating fire. Meanwhile, we encourage you to go to our home page and register for our free i3 webinars, which will provide more useful information about how we are supporting church visions with buildings that work.